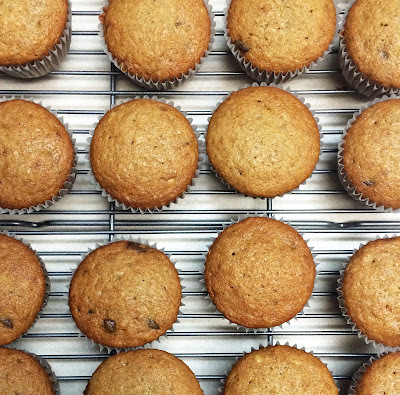 I have baked a batch of banana muffins every week since school started. It is a combination of just having a lot of bananas turning too quickly and trying to have something for my teenage son to pack in his post cross country practice breakfast. I have tried a bunch of different recipes and combined a few and I think I have found my families all time favorite. In a bowl, combine dry ingredients and set aside. In a second bowl, mix together softened butter and sugars. Once combined, add the eggs, vanilla, and mashed bananas and mix. Slowly add the dry ingredients to the banana mixture and stir. Add chips or nuts if desired. Fill each muffin tin 2/3 of the way with batter. Bake for 18-20 minutes Immediately remove from muffin tin and allow to cool on a wire rack.